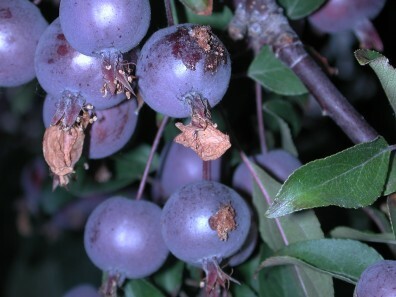 Periodically, scout fruit on the tree throughout the growing season for infested fruit. Remove and dispose of any “wormy” fruit. 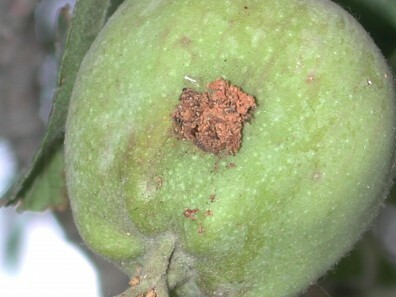 Do not leave infested fruit on the ground beneath the tree or the caterpillar may continue to feed and develop within dropped fruit. 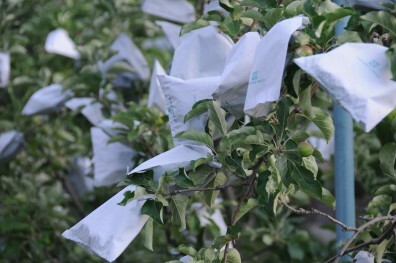 Individually bag each fruit on the tree when fruit is less than 1 inch in diameter using standard paper bags, or commercially available apple bags. This provides a barrier that keeps codling moth adults and larvae from finding the fruit (Figure 6). These bags can be removed one to two weeks before fruit harvest to allow for proper color development on the apple surface. Two-inch wide corrugated cardboard bands placed around the lower trunk of the host tree will attract larvae searching for a place to pupate. These bands can be placed on the trees in late May, then removed and disposed of before the adult moths begin to emerge in mid June. 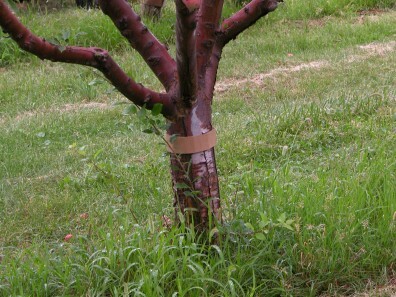 Fresh cardboard bands can be placed on the trees in mid July to attract the next generation of caterpillars, then removed and destroyed a couple weeks after fruit harvest. Select early-maturing varieties of apples to avoid that third generation of moths. Look for other codling moth sources in your home landscape. If possible, remove any infested apple, crabapple, large-fruited hawthorn, pear, ornamental pear, and quince trees.